Here’ the second part of our new puppy checklist. Again, we don’t get compensation for any products recommended on this page. Brushes – We use a couple of different brushes on our dogs. For regular grooming, we use a natural bristle brush. We recommend brushing your dog once per week, more often if they are spending a lot of time in the field. Regular brushing has a couple of advantages. First it helps keep dog hair out of your house. Secondly, it’s bonding time with your puppy. It also is good for your Brittany pup to be used to grooming. Depending on where you live, after a run in the field, your puppy may have burs, stickers or other “debris” in caught in their coat. You’ll want to remove these to prevent irritation (especially in tender areas like the armpits and groin). If you’re dog is used to brushing, it’s easier on both of you when it comes time to remove the debris. We like a deshedding tool/brush during times of the year when Brittanys tend to shed more. It helps grab those loose hairs and keeps close to the brush which makes for easy clean up. 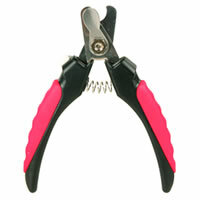 Nail Clippers – We start trimming puppy nails with regular toenail clippers. By the time you pick up your puppy they will have already had their nails trimmed several times. We recommend you keep this up. It’s much easer to trim nails as they grow older, if the get used to it as a pup. We have our dogs lie on their back in between our legs. They get lots of belly rubs between nail clips. You can also have your dog sit or stand and lift the foot up while you trim the nails. Again, it’s a chance to bond with your pup as well. When it’s time to move to dog nail clippers, we prefer the scissor trimmers that have a guide. They guide can help prevent you from cutting the nail to short – which is very painful and will bleed profusely. We also recommend a battery operated electric nail trimmer/shaper. We only use these after we’ve cut the nail to smooth out any sharp or rough edges. Introduce your pup to these slowly and be sure to follow the instructions provided to avoid injuring your pup’s nails. Toothbrush & Toothpaste – These usually come in kits with a finger brush, a double ended toothbrush and flavored toothpaste. We start our dogs out with the finger brush to allow them to get used to it. Then we use a mix of the finger brush and the tooth brush as they get older. Puppy Shampoo – We don’t have any specific recommendations for a brand of puppy shampoo. We actually use puppy shampoo on our grown dogs (unless they’ve gotten into something particularly smelly). Don’t use people shampoo on dogs or puppies. It can strip the natural oils from their coat leading to dry skin and irritation. It’s also handy to have dog wipes. Similar to baby wipes, these allow you to quickly wipe your pup down. They are great for traveling (in case your pup gets carsick or has an accident) and are handy for muddy days. Nature’s Miracle or other carpet cleaner – Your puppy will have accidents, so carpet cleaner is a must have. Nature’s Miracle has a whole line of cleaning products is specially formulated to remove odors and stains. Even though you may not be able to smell “left-over” odors from where your puppy has had an accident, your puppy can. If you notice that your pup’s accidents are happening in the same spots, it’s likely that there are lingering scents. Bells – We’ve had great luck with bell training our dogs. We hang a bell off the door knob (we used a bear bell from Safeway) that is low enough for the puppy to reach with their nose. Ring it every time you take your puppy outside. Help you puppy ring the bell with their nose. They’ll learn to associate the bell with going outside, and as they grow older it gives them a way to notify you they need to go without scratching your door or barking. Stuffed Toys – We like dog toys without stuffing, like Skinneeez dog toys. They don’t have any stuffing, so if your pup tears it up, you don’t have to clean up the mess, or worry about your pup eating the stuffing. They do have a squeaker, which is a concern if your puppy tears up the toy. Since Henry feels the need to immediately destroy any toy he gets his paws on, we’ve also bought stuffed animals at the thrift store. We open them up and remove the stuffing, then stitch it back together, and wash them on a hot cycle in the washer to sanitize them. If you go this route, be sure to find stuffed animals in good condition, and ones that do not have buttons or beads for eyes. They present a choking hazard for your dog. Another benefit to this, is that they don’t have squeakers. At our house, toys without squeakers seem to last a bit longer. Twisted Ropes/Knot Toys – These toys are great for teething puppies, but be sure to keep a close eye on them. Once the start to unravel, they can become a hazard for intestinal blockage. We also suggest resisting the urge to play tug-of-war with your pup. Ideally you want your puppy to learn to surrender a toy when you tell them to “drop.” This is an important thing for them to learn, as they grow there may be several things you want them to drop (food, shoes, something they found in the woods or at the dog park). This is especially important for hunting dogs – you want your dogs to return the bird to hand and not play tug-of-war with your soon to be table fair. It is okay to let them play tug with other dogs. Choose your vet – Choosing your vet can take a couple of tries. Ideally, you want a vet that you are comfortable with and is convenient for you. Don’t feel bad if you try a new vet and aren’t pleased with them. Ask your friends with pets for recommendations. It’s nice to know what they like about their vets – are they conservative, do they explain things well, do they offer boarding at their facilities, is there overnight staff, etc. We do recommend finding a vet that offers after hours and emergency services. In bigger cities, this may be more common than in rural areas. It is nice to know that if your puppy has health issues after hours, that you can call your vet and get them seen if needed. Choose you puppy kindergarden – Like choosing a vet, you need to find a trainer that fits with you and your pup. If you aren’t sure, ask to sit in on a class (with or without your pup) and see how things work. Most people can tell after a short visit if it will work for them. We’ve taken all of our dogs to puppy classes. One of the most important things you can teach your puppy, is to listen to you when there are distractions – like other dogs. Puppy classes are a great safe environment to practice that in. It also helps train you to train your dog. There are lots of things we can do to teach our pups bad habits without even realizing it. Other training resources – We are avid readers and watchers of other dog trainers. Go to your local library or bookstore and read some training books. Watch videos or read articles online (but please be wary of the source). We’ve had great results with Clicker training. Please remember that not all training techniques work for all dogs – or for all people for that matter. Try out new things and you’ll learn what works for you and your pups. Leashes – I cannot stress the importance of teaching your dog to heel and walk on a loose leash. It’s so easy to not leash train a puppy – they tend to follow you everywhere. But then you end up with a grown dog that pulls when you walk. It can be dangerous for both of you, not to mention unenjoyable! It can take a long time and be one of the more frustrating aspects of dog training – but it is extremely important! We recommend starting with a 6 foot leash. Until your pup is leash trained, we don’t recommend retractable leashes. It’s too easy to be “lazy” and stand in one spot while your pup wanders around. Not a big deal when they are puppies, but again, not much fun when they are full grown, wrapping their leash around trees and park benches (or your legs). Leash training is one of the best things you can teach your pup! Fencing – Ideally you’ll have a fenced in area for your dog to play in. This gives you a safe area to work on off leash training and a place for your pup to play and hang out. Be sure to check your fence for any stray wires or fence ties that a collar could get hung up on. Make sure your dog can’t jump over your fence (or isn’t tempted to try). It’s a good idea to start out with supervised time in a fenced in yard, then graduate to small blocks of unsupervised time. If you don’t have a fence, there are places in town that you may be able to use to work on off leash training. Some dog parks have fenced areas. Check with your local Parks and Recreation department – soccer fields, ball fields and tennis courts may be an option. Just make sure to clean up after your pup. Wireless Fence – We have a PetSafe Wireless fence and love it. It consists of a small transmitter, a collar and some marking flags. Our dogs were already used to e-collars when we bought the unit, so it was quick and easy to train them. The transmitter has an adjustable range and the collars have adjustable stimulation levels. Additional collars can be purchased (including a stubborn dog option – though we don’t personally know anyone that’s needed it). When you first set up the unit, you walk around with the collar to learn your perimeter. Place the flags along your perimeter to give you dog a visual of where their boundaries are. The collar beeps when the dog gets close to the perimeter, if the dog continues outside the perimeter, they receive a mild shock. The unit comes with training instructions and PetSafe has some setup and training videos on their website. We take this unit with us when we travel during hunting season. We can set it up, show our dogs the perimeter, and they have a safe place to hang out outside. One side note, is that the unit does use electricity. I can’t give a specific cost per month, but we did notice an increase in our bill once we started using the unit. We’re not saying you need to rush out and buy everything on this list. In fact some items, like the wireless fence, we don’t recommend using on young puppies. We just wanted to share with you the tools we’ve found helpful. Believe me, I went through several dog brushes before I found ones that worked well for us (the same thing with e-collars). As always, please contact us if you’ve got a question about any of the items we mentioned or about your new Brittany pup! I am getting a Brittany from a breeder and would like a third party opinion. She is letting them leave the litter at 6 weeks, if they are properly weaned. Is this okay? I’ve heard 8 weeks is normal. Also, we were trying to get our pick of the litter before other people. We set it up for this weekend (theyd be 4 weeks) but then she’s trying to reschedule for next weekend claiming unexpected plans(think its the SEC game) and also saying that at this age their personalities aren’t that developed and asked if we wanted to come next weekend. I guess my question is, is 4 weeks too soon to choose? She is sending a video of the puppies on Monday and I am sure the other families will choose from it before next weekend. We let our pups go home at 8 weeks. I really do think that they learn a lot about how to behave around other dogs in those last 2 weeks. I do agree with the personalities not being fully developed at 4 weeks. We try to have people start making their picks at 5 weeks (but have done 4 weeks on occasion). At 4 weeks you can definitely tell who the bold and timid pups are, but sometimes that changes as they get a little older. We do let people visit when they are young. We had a couple visit at 4 weeks with our Spring litter (the husband worked out of town and was worried he wouldn’t be available when it was their turn to choose). They made a tentative choice. When it got to be their turn (around 6 1/2 weeks) they ended up choosing a different pup. We also go by the order we receive the deposit, for the order people choose their pups. That does help make it easier for us and the new owners, since everyone knows where they stand. Hope this helps. Thanks for checking out our website and let us know if we can answer any other questions.